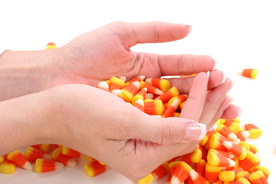 The calories found in Halloween candy can be, well, scary! Make this year’s holiday a little more health-friendly for you as well as your corporate fitness participants. Looking for an even healthier route for the children who might ring your doorbell this Halloween? Consider alternatives to candy. Several people hand out snacks such as packaged fruit or granola bars. But you can even think outside the box of food. I’ve heard of people who pass out items like small containers of Play-Doh to children, which is well received by parents. 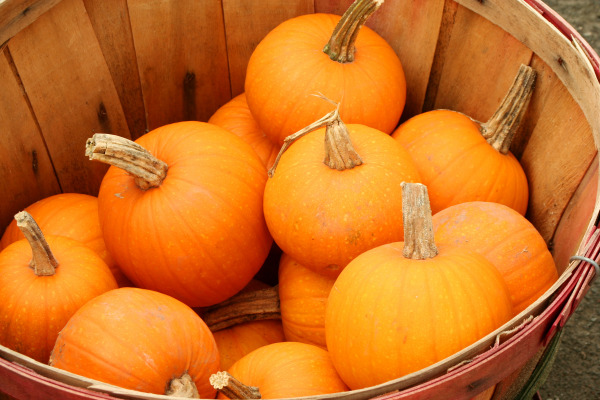 Green Halloween has other ideas for non-candy, non-food, and healthier candy options. See this page on the website for their other treat ideas! By late morning, you’re sitting at your desk and all of a sudden it’s hard to concentrate because of the aromas coming from the cafeteria, and you start thinking about what you want for lunch. Hopefully you’re not located near or in the same building as the cafeteria. I sit just below the area creating all the wonderful smells, and it’s an ongoing battle of what I want to eat and what I should eat. Some may think it makes no sense to have the onsite corporate fitness center located near the cafeteria, but a lot of onsite cafeterias now offer healthy choices. Of course there will always be the pizza, pasta bar, onion rings, and fries. It may take some willpower and motivation, but spending a few more minutes to search for the healthier options is worth it. For example, a lot of cafeterias now have whole-wheat pasta, veggie pizzas, fresh salad bars, turkey and bison burgers, and more for healthier options. Some locations are now starting to label lunch items that are under 300 to 500 calories. Check with your cafeteria because they may have a punch card that gets you one free healthy item after you purchase 10. Need a little help with making healthy choices? Schedule an appointment with your onsite corporate fitness/wellness staff for a nutrition consultation. Write down everything you eat for three days and take that food log with you when you meet with the corporate fitness center staff. Your three-day food log will help us to give you advice on changes you can make when heading to the cafeteria for breakfast or lunch. Schedule that appointment today and start making healthier choices! One commonly known benefit of corporate fitness centers is that when employees are encouraged to maintain healthy lifestyles, the company’s total costs for medical insurance and absenteeism decrease. Some agencies have chosen to take this one step further and pay for their employees to exercise. Some state agencies in Kentucky have chosen to offer paid exercise breaks. Leaders in these organizations don’t feel like they are losing productivity because, “Often these employees are discussing work issues while they are exercising.” They also see a boost in these individuals’ morale. The amount of time that employees are permitted to exercise on the clock ranges from 90 minutes to five hours per week, depending on the agency. Other organizations have similar motives, but different ways of compensating employees for their healthy habits. 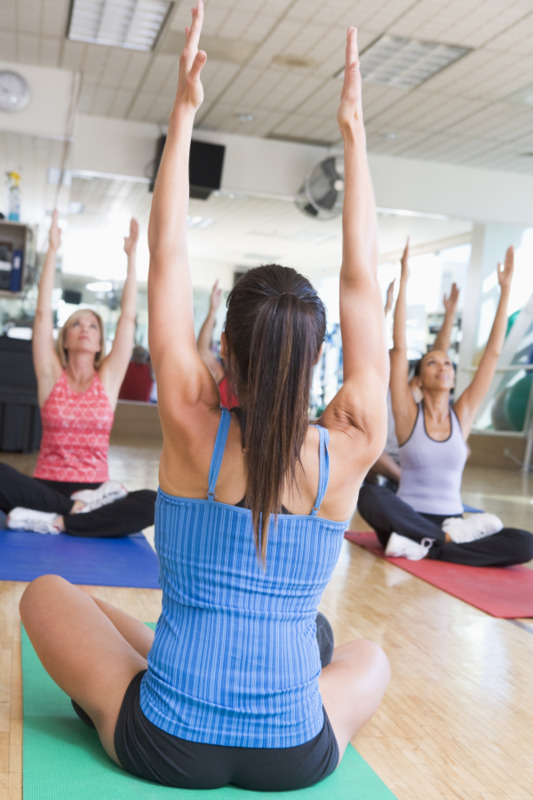 One well-known bank offers employees cash for various wellness activities. Fitting in at least one workout per month earns employees $20, taking a wellness assessment earns $50, and completing blood work or a physical earns $25 each. This particular company also pays employees for preventive care, for example flu shots and mammograms. The reward money is capped at $200 per employee. Does your company have a system to reimburse employees for their time spent exercising or otherwise bettering their health? Or perhaps a money incentive for those who utilize the corporate fitness center? The study referred to in this article found that stretching alone was not as beneficial as incorporating ergonomic training as well. Teaching employees safe ways to sit, stand, and lift while at work, especially when doing repetitive motions, is the key to keeping proper musculoskeletal alignment and preventing overuse injuries. Stretching, then, plays a role in maintaining flexibility and releasing tension from muscles that have been held in a contracted state for long periods of time. Most of our corporate wellness programming includes flexibility training, for example, in the form of a yoga class or a stretching session at the end of a group fitness class. But while we can provide programs like these, employees still spend the overwhelming majority of their workdays performing their actual job functions, whether sitting at a desk, standing at a manufacturing line, or performing manual labor. So, the stretches and exercises they perform in their short visit to the fitness center may be negated by hours spent in unsafe body postures. Does your company or corporate wellness program involve any new-hire training for proper ergonomics? In 2007, 11.7 million Americans were reported to have some form of invasive cancer. Men have a greater than 44 percent chance of developing some sort of cancer during their lifetime—this means that almost one out of every two males will be plagued by cancer. Furthermore, statistics show that more than 23 percent of men will end up dying from cancer (that’s nearly one out of every four). Women fare slightly better with a 38 percent chance of developing cancer (one in three) and a 19.6 percent chance of dying from cancer (one in five). October is National Breast Cancer Awareness Month. Why dedicate a whole month to breast cancer awareness? Of the more than 11.7 million cases of invasive cancer, about 2.6 million were breast cancer. More than 12 percent of all American women have breast cancer right now (that’s one out of every eight). 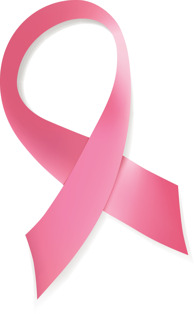 Of those women, almost 3 percent will die from breast cancer (1 in 36). Early detection and awareness provide great defense against breast cancer. Health professionals estimate thousands of lives are saved each year through regular screenings and self breast exams. Although men can be affected, being a woman is the main risk factor for developing breast cancer, as women are about 100 times more likely to have breast cancer than men. 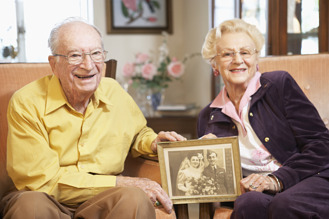 Age also plays a role in breast cancer development, with increasing age heightening your risk. About one out of every eight invasive cases occurs in women under the age of 45, whereas two out of three cases are found in women over 55. Five to ten percent of all cases are thought to be hereditary, or genetic, resulting from gene defects. Those with a positive family history of breast cancer are also at a higher risk (approximately three times more likely) than those having no immediate relatives affected by the disease. Visit www.cancer.org to find out more about the risks for developing breast cancer. Support breast cancer fighters and survivors by participating in a “Making Strides Against Breast Cancer” event. Visit the American Cancer Society online to find an event near you.